Needless to say, the current generation Ford F-150 is enjoying a great run. For example, the mid-cycle refresh has been well received, with its cleaner look and availability f the 10-speed automatic transmission across the board. The Raptor remains the standard of truck performance with its 450-horsepower 3.5-liter EcoBoost V6. To top it all off, the F-150 was named Motor Trend’s Truck of the Year. Did I mention that it was a finalist for #VOTY17? In this business, timing is everything.The arrival of the 2018 F-150 SuperCrew 4X4 Platinum came at the right time – the #VOTY17 announcement, the Motor Trend award, and remote coverage of the Los Angeles Auto Show. Needless to say, it arrived during a very busy week. If there is a story to glean from this F-150 is something that is not immediately seen here. 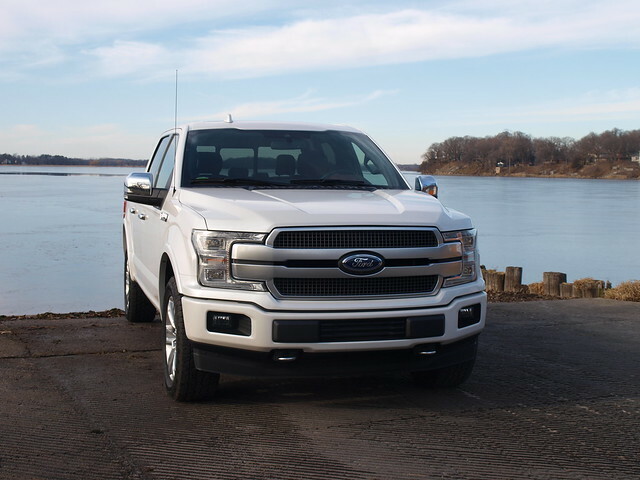 So far, every F-150 of this current aluminum cab/box over rolled steel frame generation I worked with had been powered by EcoBoost V6s – the 2.7-liter, the 3.5-liter and the Raptor’s high-performance version. 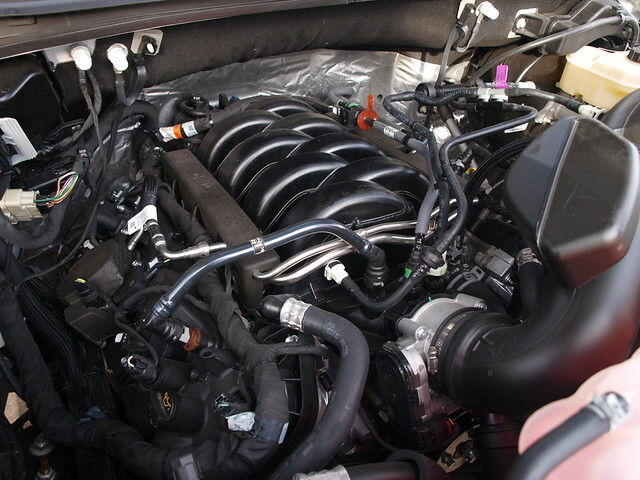 The EcoBoost has helped Ford’s truck strategy to replacing displacement with two turbochargers and the capability of equivalent naturally aspirated engines. This time around, I had underneath the hood of this 2018 F-150 SuperCrew 4X4 Platinum tester is an honest-to-God 5.0-liter V8. With 395 horsepower, it had the most high-end output of all engines, saved for the Raptor. Yet, it had a modest 400 pound-feet of torque. Since the pickup truck game is all about torque, I’ve heard some rumblings that 400 pound-feet is simply not enough. This is what makes working with pickup trucks fun. Unlike cars, there are few things a customer must be armed with before they walk onto a dealer’s lot. A pickup truck customer is supposed to versed in numbers. If they know they have a trailer to tow, the average payload they utilize on the job in the box, the kind of conditions they will be working in, and how often will they use the truck for work and/or recreation. A lot of numbers will need to be right on top of the head of the truck customer and every one of these numbers is critical to signing any paperwork. It brings up this question: Is there truly a replacement for displacement? Does a pure V8 really make sense in contrast to an EcoBoost V6? If you are not a Ford customer, then this question does not pertain to you. You have a small choice of engines, as it is. However, Ford customers are often given up to four different engine choices. A customer has to know whether their towing, payload and any other requirements will match their choice. Regarding my Platinum tester, I only had two choices to make from the order sheet: The 5.0 liter V8 and the 3.5-liter EcoBoost V6. In contrast to the V8, the twin-turbocharged V6 puts out 375 horsepower with a whopping 470 pound-feet of torque. Clearly, the EcoBoost would solve a lot of my numbers issues. But, how? This SuperCrew had the shorter 5.5-foot box behind its four-door cab, which already weighs 4,867 pounds with the V8. The EcoBoost engine adds another 50 pounds to the truck. That already seems odd that a V6 would weigh more than a V8. Yet, all of this will come into play when being asked about GVWR – Gross Vehicle Weight Rating. Truck people should know this when it comes to working situations and conditions. Another number to be concerned about that will be a factor in the truck you choose is GCWR – Gross Combined Weight Rating. This marks the absolute maximum capacity of a vehicle when combining truck, bodies, trailers, and so forth. Speaking of trailering, let’s get right down to it. Your trailer capacity is based on many factors – trailer type and mechanism, GCWR, and final rear axle ratio. At this stage, let me get right to the point. If I stuck with the V8 on the Platinum SuperCrew and the 5.5-foot box, I would have a maximum capacity of 10,900 pounds if I chose the 3.73 rear axle ratio. The 3.5 liter EcoBoost would only cap me at a 3.55 rear axle ratio, but I can tow up to 12,700 pounds, as equipped. What Ford is saying is that the EcoBoost has the opportunity to pull another 1,800 pounds even at a lower axle ratio. There has to be more than that. When using the smaller 5.5-foot box, payloads become critical here. 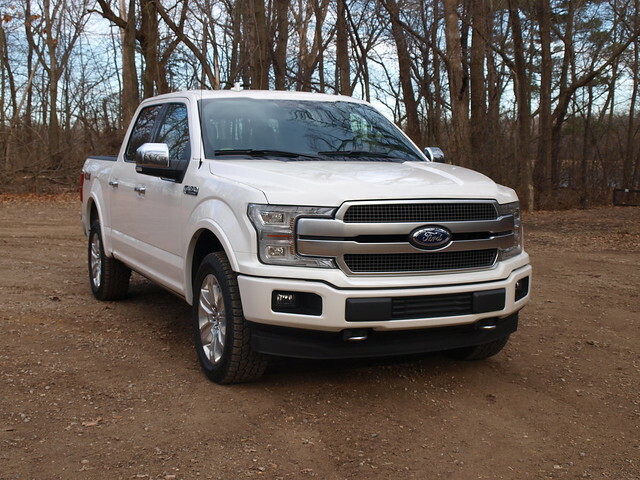 Ford tells me that I have a capacity of 2,080 pounds with the V8, but I lose 50 pounds of that payload capacity by ordering the Platinum with the EcoBoost. The fact that I have a payload capacity of over 2,000 pounds is already remarkable. These are just numbers, really. For truck customers, having them ready for their visit to the local dealership is an important part of fitting the right tool for the job…or to exactly what they need. Then, there are those of us who simply want a truck. We’re the ones everyone else hates. We don’t care about towing because we did not think of how heavy the boat we did not thoroughly consider buying would be when attached to the ball at the end of the towing bar. Nor did we care about payload capacity when thinking we could take home the entire backyard project in one trip from the home improvement center – concrete mix, pavers, and so forth. And, not everyone should look at the Platinum trim at the F-150 and say “I want one!” It is super nice – I’m not going to lie. The average truck buyer would think that it is absolutely too much for their needs. Ford offers six core trim levels for their F-150 lineup, plus the Raptor. Some trim levels offer a multitude of packages, including sportier trims, and may offer every engine option – save for the Raptor’s high-performance EcoBoost. 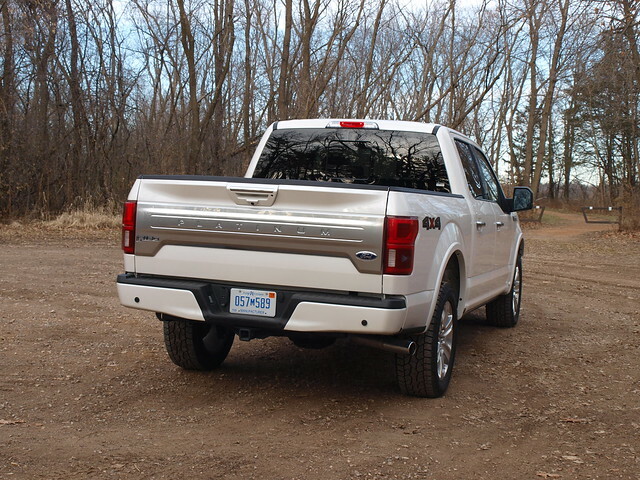 Still, F-150 SuperCrew V8 customers would be absolutely fine with a durable XLT trim with plenty of core upgrades – SYNC3 included. I look at this 2018 SuperCrew 4X4 Platinum tester and consider my own ideas. With the smooth V8 and the equally smooth 10-speed automatic transmission, knowing my capacities certainly help in a few things. I could easily tow a track day toy, bring home a barn find, even transfer a project car to a restoration or performance shop for work. But, a Platinum trim? This tester came with a sticker price of $63,800. 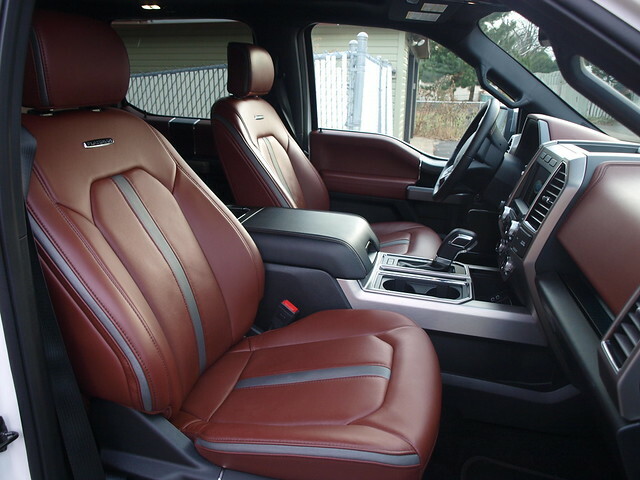 I get that it is a very high price for a pickup truck, but you really do get a lot for this price point – levels of luxury, technology, advanced safety features, and comfort included. As for the V8, I like the smooth delivery and it is rightfully coupled to the new 10-speed automatic. I averaged 18.0 MPG in the end, which is livable. This is also a better average over the last 3.5 liter EcoBoost I drove. Some have said that I would be better off with an EcoBoost for everyday driving – including a noted journalist covering pickup trucks. Come to think of it, if I wanted something luxurious for a pickup truck that offered most of the goodies seen on the Platinum, then what’s wrong with a Lariat? Actually, nothing. 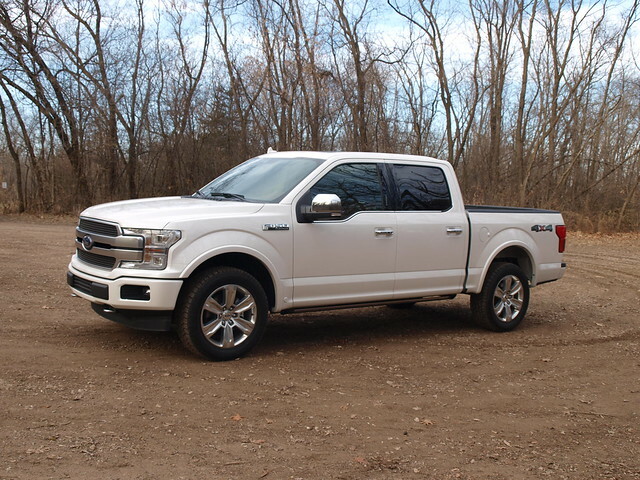 Choosing the less expensive Lariat trim also adds more engine choices – including the 2.7 liter EcoBoost V6 with 400 pound-feet of torque – the same as the V8. If I did that, my towing capacity would drop to 8,400 pounds with a 3.73 rear axle final drive ratio. The bottom line to all of this is to choose your pickup truck on your needs, rather than what it looks like. The wants will fall into place. Being a wiser pickup truck consumer will help in ensuring that you picked the right vehicle for the jobs you want to achieve. However, if your choice is a Ford F-150, be ready for some soul searching when going through the specifications and configurations. This is a huge reason why it remains the best-selling vehicle in the America. It is also a great truck – there, I said it!